Cuebur has gone from the quiet streets of Middelburg to the loudest clubs of the world showcasing his immense talent as a DJ and music producer. He has earned himself the reputation of being one of the most innovative talents to have hit the music industry with it being said that ‘without Cuebur there is no rhythm’. 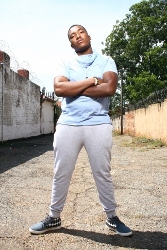 Cuebur was introduced to house music by his friend Xolani ‘DJ Xola’ Hlatshwayo. Inspired by his friend he taught himself how to DJ, knowing that he would need to push himself and his music if he wanted to succeed and realise his dreams. ‘I was only 15 when I started playing in clubs and making a name for myself.’ says Cuebur. In early 2007 Cuebur made the hit song “Pepe” which was featured on DJ Zinhle’s debut Album “Feminine Touch”. The song made waves all around South Africa and was played by the likes of Black Coffee, DJ Christos and DJ Clock just to mention a few. To solidify his love of making music Cuebur studied Advanced Music Production, Sound Engineering and Music Business at Soul Candi Institute of Music in 2010. This invaluable education empowered Cuebur with the necessary knowledge and skills required to develop his career. During his time with Soul Candi he worked with the Soul Candi crew and staff on various projects which included being featured on one the labels biggest compilations, Soulcandi Sessions 5. ‘This was a huge highlight and opened the door for me to work on another Soul Candi project called Candi Roots with DJ Mphoza and DJ Hypnosis,’ he says. The next step was for him to go solo and with the help and guidance of friends and mentors George and Joseph Mothiba ‘Revolution’ he created Cuebur – Awakened Spirit, later founding his own company called Cuebur Music which is a music publisher that disseminates his music and that of artists Rep & Belto Sladen. Another one of Cuebur’s highlights was playing at SA’s biggest festivals namely Spring Fiesta hosted by Soul Candi and playing at Oppikoppi on the Redbull stage alongside various artists from around the country and abroad. Cuebur has earned kudos wherever he has performed having shared the stage with several local and international superstars including Euphonik, Micasa, Kid Fonque DJ Fresh, Vinny Da Vinci, Revolution just to mention a few and Cueber is often referred to as one of the ‘hottest, best looking DJ’s South Africa has ever seen’. Cuebur is currently signed to Soul Candi Records and has recently released his new album ‘For Headz Only’, which features collaborations from grammy nominee Vikter Duplaix, Marissa Guzman, Thandi Draai, and many more. The album is well received and just recently got licensed to one of the world’s biggest house music record labels, Defected and will soon be released with remixes from other music producers abroad. 2014 registrations for the Soul Candi Institute of Music Digital Music Composition and Production course as well as the DJ course are now open at Boston City Campus & Business College! Register now and get 2013 prices. For more information contact Boston City Campus & Business College on 011 331-2455 or visit www.boston.co.za.